StakeMiners - This Week - 14 April 2019 Buy-Stake-Earn - Since March 2015 =============================================== Weekly Data Stakepool altcoins = 3.52 BTC, 3 active wallets. Ratecoin holding...View MoreStakeMiners - This Week - 14 April 2019 Buy-Stake-Earn - Since March 2015< =============================================== Weekly Data Stakepool altcoins = 3.52 BTC, 3 active wallets. Ratecoin holding 6.81M Ratecoin[XRA]. Ratecoin optimal block size 15,000 coins. Block explorer: Stakeminers.ca Currently mining: ZCL ------------------------------------------------- --- StakeMiners We trade on FreiExchange. Our Cryptopia wallet remains offline until they secure it, and our Yobit wallet is in maintenance with 'no ETA' on when it will be active. Our stakepool and gpu mine earning are directed to buying out our older accounts. We continue to buy and stake XRA in order to improve our earnings. -- Ratecoin (XRA) Trade volume remains very low on FreiExchange and we await the restart of trading on Cryptopia. Our price ended Sunday at 12. -- 1 BTC Stake Earning Rate in USD - March 2019 Next update at the end of April 2019. Daily 0.00009683 ( 0.40 USD) Weekly 0.00067781 ( 2.86 USD) Montly 0.00290491 ( 12.24 USD) March 2019, annual earning rate: Monthly $12.24 x 12 months = $146.88 / $4139 BTC 31 March = 0.0354 * 100 = 3.54%. February 2019, annual earning rate: Monthly $11.34 x 12 months = $136.08 / $3846 BTC 28 February = 0.0353 * 100 = 3.53%. January 2019, annual earning rate: Monthly $11.49 x 12 months = $137.88 / $3586 BTC 27 January = 0.0384 * 100 = 3.84%. 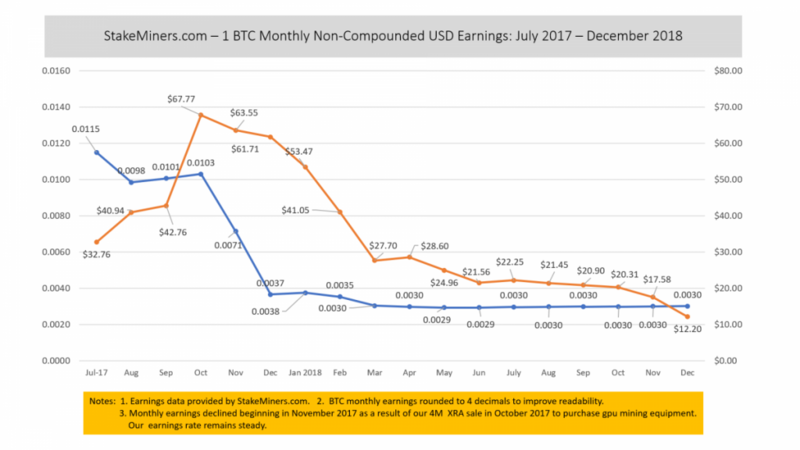 There is no change from December 2018 to January 2019 as the price of bitcoin fell more than our earning rate resulting in no change to the actual monthly rate at the 2 decimal reporting level. Q2-2019 Apr-Jun Earning Average: pending Q1-2019 Jan-Mar Earning Average: 3.64% Q4-2018 Oct-Dec Earning Average: 4.20% Q3-2018 Jul-Sep Earning Average: 3.59% -- Social Media Crypto-City: XRA-Rate-Coin Facebook: StakeMiners Twitter: @Stakeminers, @Ratecoinxra Discord channel: >https://discord.gg/K5YdW3H ------------------------------------------------------- -- StakeMiners Cryptocurrency (StakeMiners.com) is an altcoin Proof of Stake (POS) company. Our email is: info@stakeminers.com. 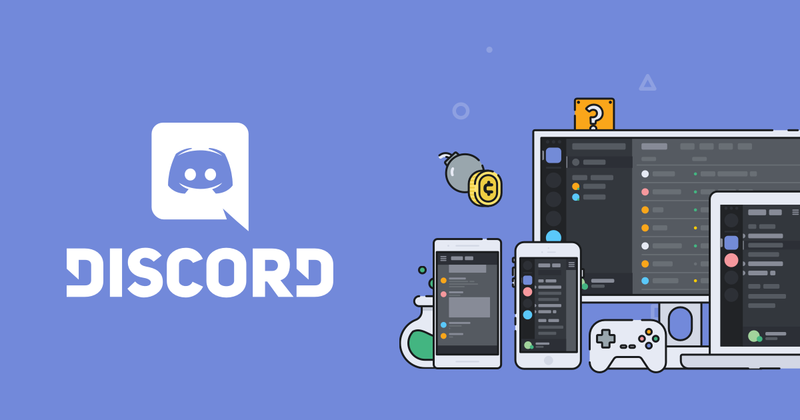 Join the RatecoinXRA Discord Server! Check out the RatecoinXRA community on Discord - hang out with 25 other members and enjoy free voice and text chat. StakeMiners - This Week - 07 April 2019 Buy-Stake-Earn - Since March 2015 =============================================== Weekly Data Stakepool altcoins = 3.49 BTC, 3 active wallets. Ratecoin ho...View MoreStakeMiners - This Week - 07 April 2019 Buy-Stake-Earn - Since March 2015< =============================================== Weekly Data Stakepool altcoins = 3.49 BTC, 3 active wallets. Ratecoin holding 6.69M Ratecoin[XRA]. Ratecoin optimal block size 15,000 coins. Block explorer: Stakeminers.ca Currently mining: alternating with ZCL, ZEN, and ZEC (week 2) ------------------------------------------------- --- StakeMiners We trade on FreiExchange, at Cryptopia XRA remains offline until the wallet has been secured. We have cancelled our buy/sell orders and will step back into the market once trading resumes. Yobit XRA wallet is in maintenance, however StakeMiners does not trade there. We bought out another 3 accounts this week and continue to buy Ratecoin from the market which is added to our stakepool. Earnings from the stakepool and gpu mine are currently directed to buyout past accounts. -- Ratecoin (XRA) XRA had a slow trading week with Yobit wallet still in maintenance, and Cryptopia wallet still offline as they continue their restart. FreiExchange was experiencing some withdrawal delays, however there are no reports of an impact on Ratecoin. Our price ended Sunday at 11. -- 1 BTC Stake Earning Rate in USD - March 2019 Next update at the end of April 2019. Daily 0.00009683 ( 0.40 USD) Weekly 0.00067781 ( 2.86 USD) Montly 0.00290491 ( 12.24 USD) March 2019, annual earning rate: Monthly $12.24 x 12 months = $146.88 / $4139 BTC 31 March = 0.0354 * 100 = 3.54%. Q2-2019 Apr-Jun Earning Average: pending Q1-2019 Jan-Mar Earning Average: 3.64% Q4-2018 Oct-Dec Earning Average: 4.20% Q3-2018 Jul-Sep Earning Average: 3.59% Note: There is no change from December 2018 to January 2019 as the price of bitcoin fell more than our earning rate resulting in no change to the actual monthly rate at the 2 decimal reporting level. -- Social Media Crypto-City: XRA-Rate-Coin Facebook: StakeMiners Twitter: @Stakeminers, @Ratecoinxra Discord channel: >https://discord.gg/K5YdW3H ------------------------------------------------------- -- StakeMiners Cryptocurrency (StakeMiners.com) is an altcoin Proof of Stake (POS) company. Our email is: info@stakeminers.com. StakeMiners - This Week - 24 March 2019 Buy-Stake-Earn - Since March 2015 =============================================== Weekly Data Stakepool altcoins = 3.44 BTC, 3 active wallets. Ratecoin ho...View MoreStakeMiners - This Week - 24 March 2019 Buy-Stake-Earn - Since March 2015< =============================================== Weekly Data Stakepool altcoins = 3.44 BTC, 3 active wallets. Ratecoin holding 6.45M Ratecoin[XRA]. Ratecoin optimal block size 15,000 coins. Block explorer: Stakeminers.ca Currently mining: ZCL -------------------------------------------------- --- StakeMiners Trading has resumed on FreiExchange, at Cryptopia our balances are in place though trading of Ratecoin XRA remains offline until the wallet has been secured by their team. We have removed all our buy/sell orders and will step back into the market once trading resumes. In addition to account buyouts the past year, we have increased our stakepool from 2.65 to 3.44 BTC, a 30% increase. We continue to direct stakepool and gpu mine earnings to buyouts until compelete, then we'll redirect earnings to Ratecoin support. -- Ratecoin (XRA) Trading has just resumed at FreiExchange with the Sell/Buy ratio at 3:1. -- 1 BTC Stake Earning Rate in USD - February 2019 Next update at the end of March 2019. Daily 0.00009715 (0.38 USD) Weekly 0.00068005 (02.64 USD) Montly 0.00291451 (11.34 USD) February 2019, annual earning rate: Monthly $11.34 x 12 months = $136.08 / $3846 BTC 28 February = 0.0353 * 100 = 3.53%. January 2019, annual earning rate: Monthly $11.49 x 12 months = $137.88 / $3586 BTC 27 January = 0.0384 * 100 = 3.84%. Quarters have been restated to follow a calendar year. There is no change from December to January as the price of bitcoin fell more than our earning rate resulting in no change to the actual monthly rate at the 2 decimal reporting level. Q1-2019 Jan-Mar Earning Average: pending Q4-2018 Oct-Dec Earning Average:4.20% Q3-2018 Jul-Sep Earning Average:3.59% -- Social Media Crypto-City: XRA-Rate-Coin Facebook: StakeMiners Twitter: @Stakeminers, @Ratecoinxra Discord channel: >https://discord.gg/K5YdW3H ------------------------------------------------------- -- StakeMiners Cryptocurrency (StakeMiners.com) is an altcoin Proof of Stake (POS) company. Our email is: info@stakeminers.com. Light trading over the past week on FreiExchange. The Sell/Buy ratio steady at 4:1. @StakeMiners supports trading. Cryptopia is begining to process reopen and we will provide an XRA trading update onc...View MoreLight trading over the past week on FreiExchange. The Sell/Buy ratio steady at 4:1. @StakeMiners supports trading. Cryptopia is begining to process reopen and we will provide an XRA trading update once we know more. @StakeMiners has updated our BTC Earnings Chart to include February 2019 stake data. StakeMiners - This Week - 17 February 2019 Buy-Stake-Earn - Since March 2015 =============================================== Weekly Data Stakepool altcoins = 3.32 BTC, 3 active wallets. Ratecoin hold...View MoreStakeMiners - This Week - 17 February 2019 Buy-Stake-Earn - Since March 2015< =============================================== Weekly Data Stakepool altcoins = 3.32 BTC, 3 active wallets. Ratecoin holding 6.14M Ratecoin[XRA]. Ratecoin optimal block size 15,000 coins. Block explorer: Stakeminers.ca Currently mining: ZCL this week. -------------------------------------------------- --- StakeMiners StakeMines is planning to deploy a Checkpoint Server. If implemented this would require a hard fork of the Ratecoin wallets, and at the same time all the wallets would be updated. Any final decision will be communicated well in advance of any wallet upgrade. -- Account Payouts No buyout this week. -- Ratecoin (XRA) Ratecoin had another interesting week as volume pushed just over 1 BTC on Yobit. As well, FreiExchange saw good volume at the beginning of the week. Volume in February has been much stronger than last month. Given Yobit's buy pressure we consider it an indication of some arbitrage by Traders which improves trade volume and price. -- 1 BTC Stake Earning Rate in USD - January 2019 Next update at the end of February 2019. Daily 0.00009873 (0.38 USD) Weekly 0.00069111 (02.68 USD) Montly 0.00296191 (11.49 USD) Annual earning rate January 2019: Monthly $11.49 x 12 months = $137.88 / $3586 BTC 27 January = 0.0384 * 100 = 3.84%. Quarters have been restated to follow a calendar year. There is no change from December to January as the price of bitcoin fell more than our earning rate resulting in no change to the actual monthly rate at the 2 decimal reporting level. Q1-2019 Jan-Mar Earning Average: pending Q4-2018 Oct-Dec Earning Average:4.20% Q3-2018 Jul-Sep Earning Average:3.59% -- Social Media Crypto-City: XRA-Rate-Coin Facebook: StakeMiners Twitter: @Stakeminers, @Ratecoinxra Discord channel: >https://discord.gg/K5YdW3H ------------------------------------------------------- -- StakeMiners Cryptocurrency (StakeMiners.com) is an altcoin Proof of Stake (POS) company. Our email is: info@stakeminers.com. FreiExchange trading was light but steady again this week with some end of week selling. We may be seeing arbitrage from Yobit exchange given the volume changes there over the past 24 hours. Stake...View MoreFreiExchange trading was light but steady again this week with some end of week selling. We may be seeing arbitrage from Yobit exchange given the volume changes there over the past 24 hours. StakeMiners is considering deployment of a checkpoint server and this would require a hard fork to our wallets. If we do this we will communicate in advance so that clients can upgrade their wallets in a timely manner. We invite you to trade with us on FreiExchange: https://freiexchange.com. Sign up today. Freiexchange is a exchange for crypto coins.